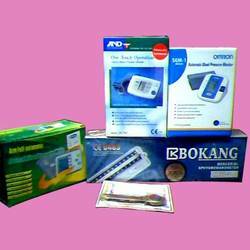 Trader and supplier of Blood Pressure measuring products. These blood pressure equipment include monitors, Blood Pressure measuring meters, inflatable bulb and bladder. Our range of Blood Pressure Care Equipment is easy to use and is widely demanded for personnel as well as by leading medical practitioners of the country. Our clients can avail from us Blood Pressure Measuring Machine that are widely used in hospitals, clinics, nursing homes and dispensaries. All our machines are designed and developed in compliance with health industry standards, using premium raw material, which is sourced from the reliable vendors of the market. In addition to this, our expert quality controllers stringently check all the products on various parameters to ensure flawlessness. Blood pressure and pulse are displayed simultaneously. We have available with us a varying range of Blood Pressure Care Equipment that is procured from reliable vendors based across the globe. These blood pressure equipment include monitors, BP measuring meters, inflatable bulb and bladder. Our range of B.P. Care Equipment is easy to use and is widely demanded for personnel as well as by leading medical practitioners of the country. Looking for Blood Pressure Measuring Products ?